What a time it has been. I came to Darwin without a clue, with no plan, no job and no money. I found friends after a week, a car and a job after two weeks, a girlfriend after three weeks, what a great start. But the six months working as a Concierge in a five-star hotel went by like no time at all. And here I am, ready to go. Not ready to leave my friends and girlfriend behind, but I have no choice. Its time to go to Queensland. On Wednesday, the 15th of September, the journey will begin. Darwin-Brisbane, the way I will drive it, there are 6.061 km ahead of me. Australia is such a big country, 6.000 km is more than from Lissabon to Moscow, to give you an idea in European terms. My journey will be made of three parts. Part I is the easiest, all along the same major Highway, the famous Stuart Highway that goes all the way from Darwin to Adelaide. I won’t be driving that far: I will turn off just after Alice Springs, Part I is Darwin-Uluru. 1.938 km, enough for 4 days driving. Darwin is °13 South, Uluru is 26°. In Darwin we get 34 °C everyday. Ayers Rock gets frost at nights. After climbing up Ayers Rock, the second part is through the desert! Almost 1000 kms of dirt road through the middle of nowhere – literally! 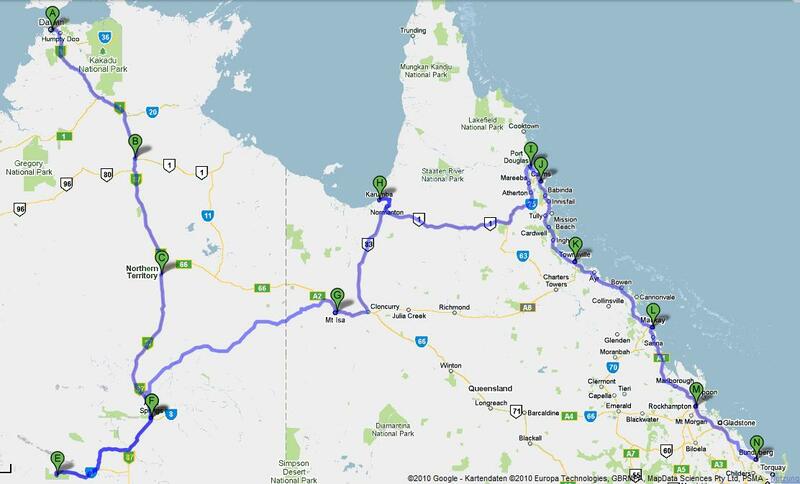 Part II, Uluru-Cairns, is a total of 2.637 km, and will be driven in 6 days. The third part is the most entertaining one, and the safest drive of all. Roughly 1.400 km along the Coast. Part III is Cairns-Bundaberg. More on Wednesday, the 15th of September!